A pterygium is a triangular, fleshy fibrovascular tissue that grows in the conjunctiva, the thin, clear covering of your eye. Usually, a pterygium appears in the inside corner of your eye closest to your nose, although it can appear on the outer corner, as well. It grows from the corner across the cornea, towards your pupil, the dark circle in the center of your iris. If a pterygium grows large enough, it can interfere with your vision, such as in cases where it grows over the cornea. Pterygium can cause redness in your eye, tearing and irritation. In rare situations, a pterygium can impact the shape of the cornea and cause astigmatism, thus impacting your ability to see clearly. Who Is at Risk for Pterygium? The causes of pterygium are not fully understood. However, there is a link to prolonged exposure to sun and dry, dusty conditions. It is more common in people who spend a great deal of time outdoors, particular in hot, dry areas. As a protection, you should always wear sunglasses with UV protection, whenever you are outside. 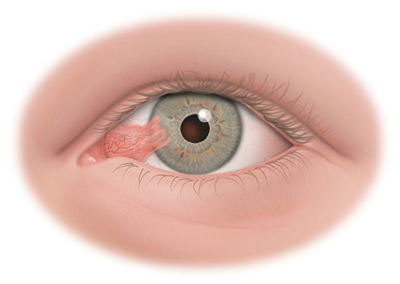 A pterygium is detected during a routine eye exam. Your doctor will use a slit lamp examination to detect pterygium. In addition, he may also use corneal topography. Once you have been diagnosed with pterygium, your doctor will want to conduct these tests once or twice a year. Along with a visual acuity test, he will want to monitor the growth of the pterygium as well as any changes in your vision. Because pterygium is impacted by environmental factors, mild cases will be controlled by frequently lubricating your eyes with eye drops. In addition, wearing glasses with UV protection (not just sunglasses) may also help. You should also avoid dry, dusty and smoky areas as much as possible. If the inflammation in your eye is more severe, your doctor will likely prescribe a topical antihistamine / decongestant or a mild topical steroid. If the pterygium grows so large that it impacts your vision or if it is a severe cosmetic problem, it can be surgically removed.